We stayed in Monterey for a couple of days as part of a longer California coastal trip over winter break that also included San Francisco and Santa Barbara. It's a beautiful coastal town that makes a great home base if you're also checking out nearby Big Sur and Carmel. Monterey's No. 1 draw is the Monterey Bay Aquarium, and it lives up to the hype (and is accordingly priced!). Built right on the bay, the facility is gorgeously maintained, with a clean, modern design and well-presented exhibits. There are mesmerizing schools of fish everywhere, numerous touch tanks, and the jellyfish section is particularly impressive — who knew there were so many types? We'd wanted to go hiking at Point Lobos State Reserve in Carmel to get a glimpse of the sea lions, but a severe, weeklong rainstorm flooded the trails and forced us to change course. Instead, we wound up at Garrapata State Park, and the views couldn't be any more dramatically beautiful. 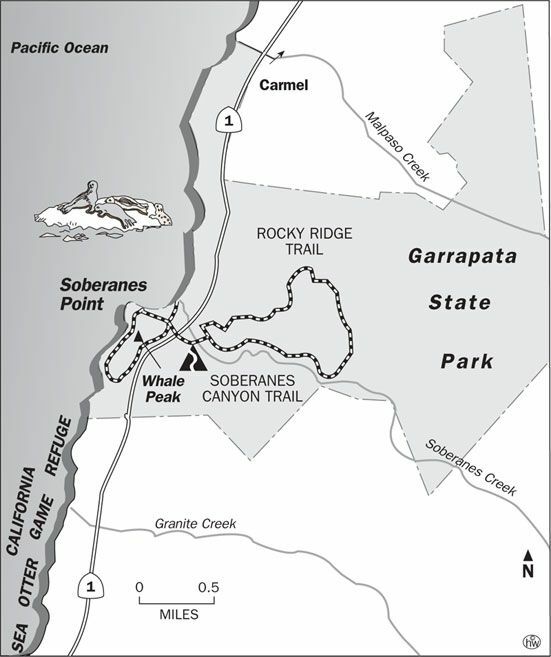 We followed the Soberanes Point loop to the left of Route 1 on this map, which took only 20 minutes to complete. The trail is easy to hike, but the drop-offs are steep and sometimes there's only a thin rope separating you from the edge of a cliff, so hold onto the little ones! If you hop on the famously scenic Pacific Coast Highway (Route 1) from Monterey and head south toward Big Sur, you'll soon encounter some of the most dramatic coastal views in the world. Record-breaking storms, wind, and even mudslides couldn't stop us from making it to the widely photographed Bixby Bridge, and we managed to take some photos from the lookout point before ducking back into the car, completely soaked! If you're looking for a place to grab lunch after a morning at the aquarium, skip touristy Cannery Row and walk about four blocks to Il Vecchio, a restaurant that offers a "worker's lunch" from noon to 1:30. This adorably rustic Italian eatery dishes out a limited prix-fixe menu (basically you choose between two housemade pastas, which rotate by the day) and the food is brought out straight from the stove and plated at your table. It's all very quaint, simple and delicious. One night we grabbed dinner at La Bahia, a casual Mexican restaurant (no website, so here's the Yelp page). It was an easy-breezy meal that involved burritos so large, just one could've fed my whole family. The tamales were also fantastic. We had many plans for hiking and lunching in nearby Big Sur, but as mentioned, Mother Nature put a kibosh on all that by shutting down that stretch of the Pacific Coast Highway. Big Sur was literally inaccessible to us since the PCH is the only way in and out. Still, here's what we had planned: Pfeiffer Beach, famous for its purple sand and photogenic archway; the restaurant Nepenthe, legendary for its outdoor seating, perched on the edge of a cliff overlooking the Pacific Ocean; and Julia Pfeiffer Burns State Park, which features an easy hike with a big payoff, McWay Falls. Hopefully we'll make it to these places one day!